Home » Accommodation » Where to Stay in Trat? Or perhaps that should be ‘Why stay in Trat?’, as although Trat town is the largest municipality in the area, very few people stay there by choice. Most visitors are passing through, on their way from Bangkok to Koh Kood or Koh Mak or Cambodia. They arrive late and leave early the next morning. And to be honest the Thai Tourist Authorities don’t really encourage people to visit. Their page for Trat contains no useful information. But, for anyone with a bit of time on their hands, Trat is definitely worth a stopover. Tourists coming to Koh Chang will only see Trat if they pass through the bus station, and to be honest, most will be heading directly to their hotel on the island. So won’t bother with an overnight stay. However, visitors to Koh Kood, for example, often have a night here on the way as the last boat to Koh Kood is at 14:20. This makes is very difficult to get from Bangkok to the island in a day using public transport. But why not leave Bangkok early morning, arrive in Trat mid-afternoon and then have enough time to take a look around the town. This will provide you with an excellent way to see some normal life during their holiday. There aren’t any earth-shattering, jaw-dropping, selfie-worthy sights in the town. ( Although the small museum is very interesting for 30 minutes or so. ) It’s just a laid back, friendly Thai town that anyone who wants to see what real life in Thailand, as opposed to the life that most tourists see, should visit. The main highlights are the nightly food market in the town centre; Trat museum; the narrow lanes with wooden houses near the river and the Tesco supermarket. There’s also a large private hospital, the Bangkok Trat Hospital, which is probably where you’ll end up if you have a serious scooter accident on one of the islands. Until a few years ago the choice of hotels was limited to two rather grotty places. Trat Hotel and SA Hotel. SA Hotel was the more popular, simply because it was slightly less awful than the alternative. Thankfully, that’s all changed now and as more people discover the delights of a night in Trat, the number of small hotels and guesthouses is increasing. Many are actually very nice places to stay with helpful staff who go out of their way to make sure visitors feel welcome. There are now over 20 places to stay in the town listed on booking sites. If you’re on a tight budget, Trat must be one of the cheapest places to stay in Thailand. There are still 200 Baht/night guesthouses and you can find 20 Baht bowls of noodles on most side streets. Fortunately, the town hasn’t begun to suffer from the effects ‘tourist fatigue’. Which see rip offs, scams and an attitude that sees a guest as merely another thousand Baht in the bank. And hopefully it won’t. Keep an eye out for the old Siamese flag, a white elephant on a red background. This is often flown at government buildings and across the town during public holidays. It is used to commemorate the time back in 1907 when Trat re-joined Thailand after briefly being under French colonial rule. 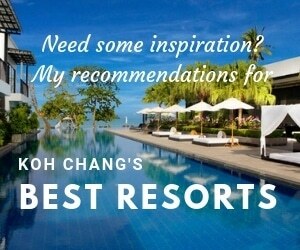 The places to stay listed here are all well under 1,500 Baht / night even in High Season. I’ve listed a few in Trat town plus places to stay near the ferry piers for anyone wanting to stay close to the pier for their boat to one of the islands. Boats to Koh Chang depart from Ao Thammachat, Koh Mak from Laem Ngop and Koh Kood from Laem Sok. A little bit of Tuscany, just south of the town centre near the Shell gas station. It may not be set amidst rolling hillsides, but Toscana Hotel is a brave attempt at making a cosy, themed hotel in suburban Trat. A town not known for it’s cosmopolitan tastes, and where even a plate of good spaghetti is hard to come by. But it works. The young owners have done a great job in providing a lovely little haven for weary travellers to lay their heads for a day or two. It’s a bit of a walk to the town centre so free bicycles are provided for guests. The pool is open at night, so if you arrive late you can have a dip before sleep. Located in the old part of Trat, near the riverside, Pop guesthouse is an old favourite for backpackers passing through Trat and has long been recommended by Lonely Planet. I guess initially because there was nowhere else to stay. The owners provide basic, cheap accommodation in two buildings located on opposite sides of the road. The rooms are showing their age a bit and the decor is a tad dated. But they’re clean and reasonably comfortable. And if you’re arriving late and leaving early then there’s a good argument for not paying more than you have to for a bed for the night. Pop guesthouse offers everything you need in a budget hangout. There’s free fast internet; knowledgeable local owners; a restaurant serving up inexpensive food and drink and a tour agents office. Here you can book bus and boat tickets to your next destination. A double fan room with shared bathroom is only 250 Baht / night. If you need AC and a private bathroom be prepared to pay 550 Baht or so. Located just north of the town centre, Trat City Hotel is a stylish, modern hotel with swimming pool and gym. It’s also within easy walking distance of Tesco supermarket. To get to the town centre takes 15 – 20 minutes on foot, but you’ll find plenty of small restaurants near Trat Hospital. One of the best in town, Saeng Fa is opposite the hospital. It’s a great coffeeshop with homemade cakes and excellent Thai food. The lobby and room interiors might be a bit bland and reminiscent of an Ikea showroom, but they are bright, airy, functional and comfortable. And whilst you can save a few Euros in a guesthouse, it is nice to have a late afternoon dip in the pool, fluffy towels and a brand new mattress to look forward to after a day on a bus. Plus there’s cable TV and free wifi, as you’d expect. The only downside is that you shouldn’t get your hopes up about the breakfast. It won’t ‘Wow’ you. But overall, this is a very good, value for money, hotel. An air-conditioned Double room with breakfast is yours for 1,000 Baht / night. Finally, the place you should really stay if you want to combine staying in the old town, plus the comforts of home, stylish decor and a great owner – Rimklong Boutque Hotel. Although it only five rooms, it’s more of a posh guesthouse that boutique hotel. Like the other two 1,000 Baht/night options mentioned above, you’ll get an air-conditioned room, free wi-fi and a comfortable bed. The difference is that this guesthouse has been built by the owner Mr ‘Tooh’, from the heart, and not as a commercial project. Needless to say he and his staff always receive rave reviews for their kindness and and friendliness. Ensuite, aircon Double room for around 1,000 Baht or splash out on the Suite for 1,400 Baht. Stay here and you’re within easy walking distance of the night market and all the small, local restaurants and streetfood that you need. Ban Sulada is an ‘old skool’ guesthouse. It’s a proper guesthouse, the type people like me used to stay in when we were travelling around 25 years ago. Run by an amiable American / Thai couple, this is the best to stay in Laem Ngop village. Years ago, Laem Ngop boomed for a brief period when tourists began coming to Koh Chang and passenger boats departed from the pier However, once the vehicle ferries arrived, foot passengers quickly began to use them instead and the village went back into hibernation. The guesthouse has a handful of rooms ranging from smaller Ground floor Twin and Double rooms to a spacious second floor suite. This features a large terrace overlooking the sea, facing Koh Chang. They aren’t the most modern rooms you will find, but have all the necessities you need for the night. The ferries to Koh Chang run until 19:30, so most people don’t have a problem getting here the same day. But if you do find yourself leaving Bangkok late and having to stay the night on the mainland then Lom Talay Resort is a popular small bungalow resort run by a local family. 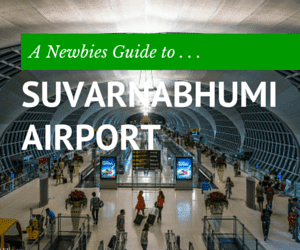 Best of all, it is only 1Km from Ao Thammachat ferry pier. So you can get up, enjoy breakfast with a view of Koh Chang and then be at your hotel on the island an hour later. Easy. The air-conditioned bungalows are set back from the shore at the back of a large garden area where guests like to laze during the day time or sit under the stars at night. There’s even a seafront BBQ area for anyone who’s brought a bag full of meat with them on holiday. The bungalows all feature free wifi, satellite TV, fridge and tea and coffee making facilities. Either Twin and Double beds are available. Laem Sok is the pier that the boats services to Koh Kood use. The boat companies all provide free transport from hotels in Trat to the pier, but if you prefer to get up late and have a short walk to the ticket office, then Analay Check in and Chill Out is a great choice. It’s a small, modern resort located under 100 metres walk from the pier. There are only 10 ensuite rooms. These are a bit on the small side but are air-conditioned and come with chunky wooden furniture, free wifi and satellite TV. There is also a restaurant and large free-form pool on site. Whilst there aren’t any shops nearby, the resort does have it’s own mini-mart and also offers bicycles for guests to use to explore the nearby area. The only real downside is that it’s hard to book, as it isn’t listed on Agoda or booking.com. This means that unless you are travelling at the busiest times of year New Year and Songkran (Thai New Year), you’ll be able to show up and get a room. But if you want to book in advance you’ll find contact details on their Facebook page listed below. Double rooms are from 1,000 Baht / night. Unfortunately, Analay Check in and Chill Out isn’t listed on online booking sites at the moment.